To purchase your silk flag, scarf garment etc. online, first select a design in our Online Shop, then click on a design to view the design in full detail to select your required format. 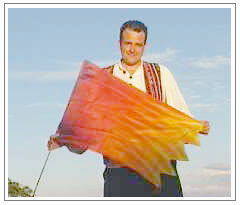 These large hand-painted silk flags are ideal for a man or woman after God's own heart. Great for public worship indoors or outdoors. 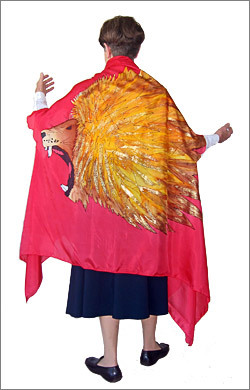 Can be seen from greater distances and make a very strong statement in parades, processions, performance. 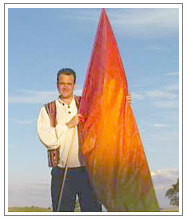 Large flags are particularly effective when used to minister to individuals and groups. These medium sized handpainted silk flags are ideal if there are low ceilings or confined spaces. They are useful for dance groups, having an impact outdoors and ministering to individuals. Very easy to handle for teenagers and older children. These smaller hand-painted silk flags add colour and can be tucked away easily. Especially good for limited space and for children of all ages. They add a touch of colour without needing very much room. Put on a Garment of Praise for any reason. Become a walking flag inside this handpainted garment. The garment slips over existing clothing and feels great. It is hard to fell "heavy" with one of these beautifully bright and light garments on you. There is nothing subtle about this. Our biggest wearable flag. One size fits most. For extra-tiny or extra-large worshippers ask for a quote! A wearable flag - for a big statement in the Spirit! For a woman who is not embarrassed to stand up and be counted. This large accessory adds a splash of colour to any outfit - take it where flags cannot go or whip it off and use it as a flag when the time is right. A bold prophetic accessory. Make a prophetic statement with your wardrobe. It was created in response to intercessors wanting to take and use these prophetic objects when flags were less appropriate. 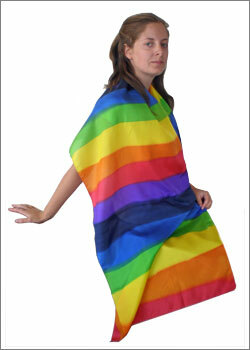 A wearable flag - make a prophetic statement with your wardrobe. This hand-painted silk scarf is versatile and dramatic. Makes a strong statement and can lead to very productive connections. Great for the intercessors, prophets and people wanting to make a strong statement. Wonderful as a gift! A classy wearable flag for any occasion. A wearable flag - a classy and versatile statement for any occasion. This handpainted silk scarf can be worn in your hair, around your neck or hips! Make a colourful statement with meaning. Excellent gift or classy accessory. A wearable flag for men! Here's your chance to wear a flag into work or any situation and remind yourself all day of a concept or attribute of God. 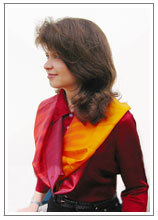 Hand-painted, 100% silk in bright colours and designs to go with any mood and compliment any outfit. Make a statement in the right Spirit! 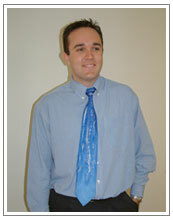 Ties are available in most designs; however there are a few designs that just don't work on ties. 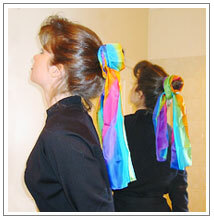 Classic gymnastic ribbons for the everyday. 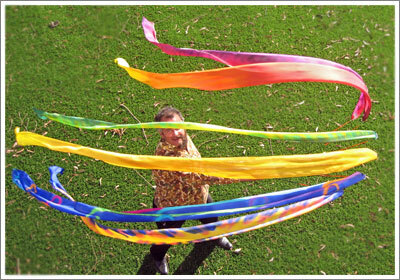 These handpainted silk ribbons are three meters long for easy use. Older children enjoy them. 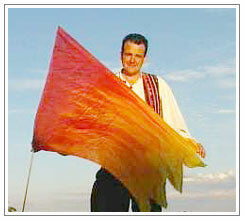 They bring colour and movement quite different to the traditional flags shape.